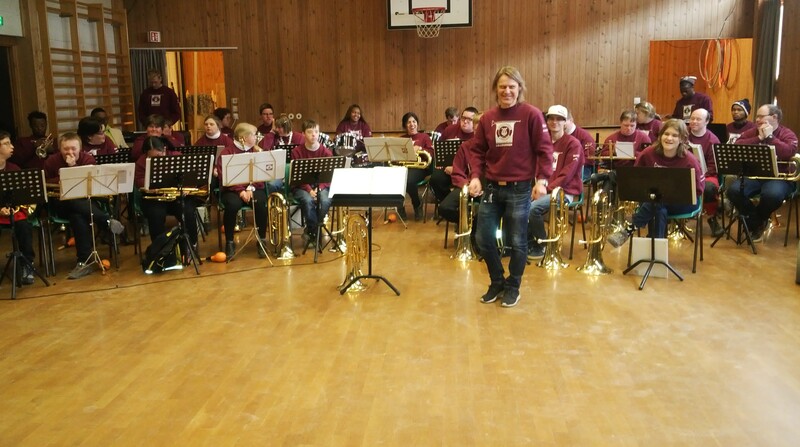 As part of our learning process we have been working with Utsiktsbakken brass band. The band was formed on 1st October 1987 at Breidablikk school in Lillehammer, a school for children and young people with learning difficulties. The band was through a partnership between parents and the school council. After the school was closed down in 1994, the band had its roots in Lillehammer Kulturskole. The band offered to all who had special educational needs, and who finds joy in music and participation in the band. The band aims to build social network between musicians, while participation in the band is good training in social behavior. This, together with the confidence built by the experience of mastery of the instrument, is well suited to heighten the individual’s social functioning. The band currently has 35 musicians ranging in age from 10 to 45 years, and has weekly joint exercises with three instructors, And this year we have also had the opportunity to be part of the musicians and not instructing but learning other methods of teaching and observing reactions from members then seeking how we can use what we are learning in this band back in the Field Band Foundation. Utsiktsbakken brass band has instructors employed from Lillehammer Kulturskole. Under expert instruction in a good and safe atmosphere, they have built the musical quality laboriously up. UBB is a socially driven band, traditionally run through parents’ efforts. It governs the procurement of instruments, uniforms, funding and organization of tours and gigs. UBB is a member of the Norwegian Band Federation (NMF). From the Pulse team it was a pleasure working with UBB and really we enjoyed the performances we had.